Lithium mining is on the rise and likely to be so indefinitely. 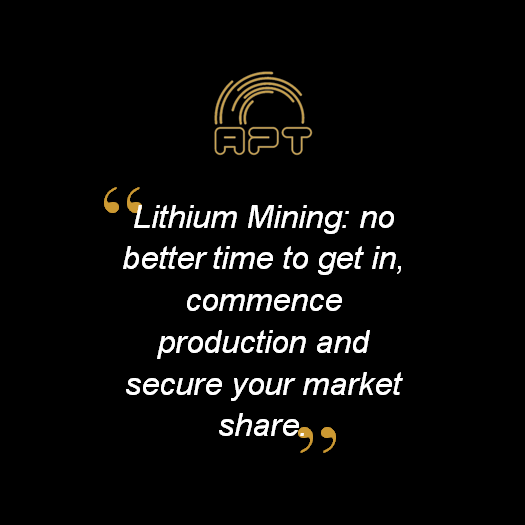 No better time to get in, commence production and secure your market share. Things can grow, but APT’s modular start-up plants offer the perfect platform to commence the lithium mining process. Our mining equipment solutions are unique and smart. The target mineralization is typically spodumene, which floats well. APT’s TriFloat cells are particularly suited to this large mass yield float and the compact six cell design results in an easily controlled format. With the addition of a simple crusher and impactor to obtain the granular start mineral size, the plant is virtually ready to go. Available in variants of 1.5, 5, 10 and 20tph, the APT Lithium recovery plant is highly simple, cost effective and correct for an easy startup. Through our associate laboratory Peacocke and Simpson amenability tests can be conducted at either lab (20kg sample required) or lab-pilot (60kg sample). If you would like to begin your venture and get into profitable production as quickly as possible, then we invite you to contact us for further information or better yet, stop by our offices! It's always great to see things in person and truly get an idea of who we are.